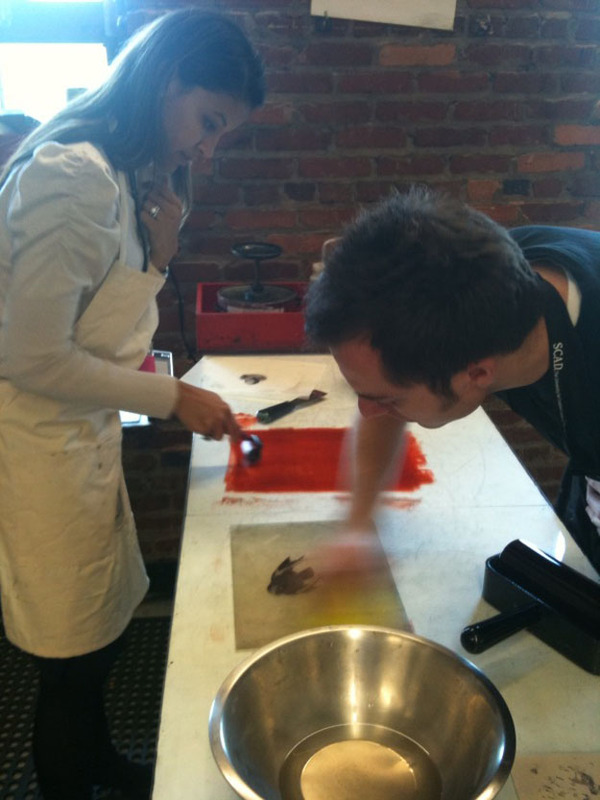 A few weekends ago I got the chance to teach a printmaking workshop with my friend Jon. We taught "Fast and Dirty Monoprints!" (exclamation point!) to some enthusiastic SCAD professors and SCAD MAT (Masters of Art in Teaching) candidates. 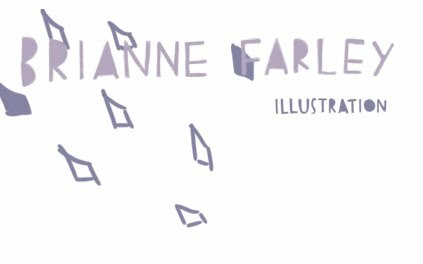 It was such a great experience, and really inspired me to incorporate more printmaking techniques in my illustrations. I forget how quick some printmaking processes are. 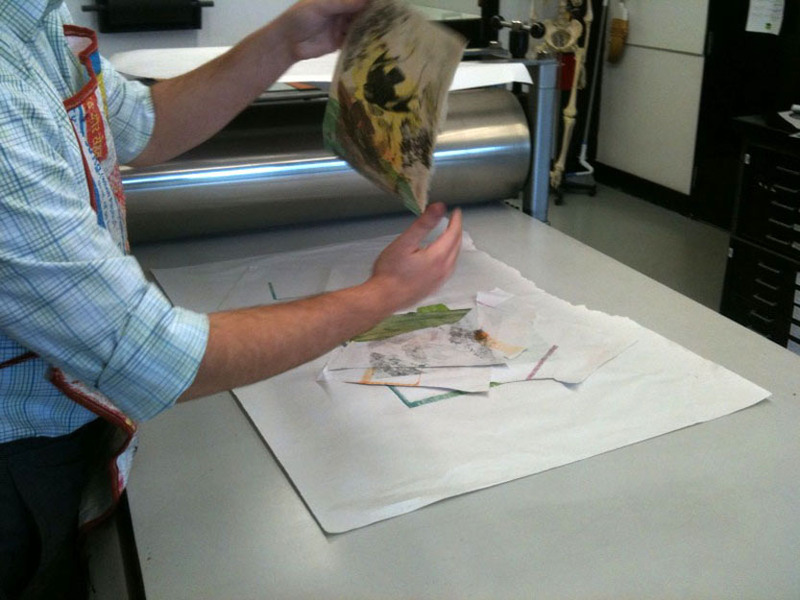 We taught prontoplate, trace monotype, and stencil relief printing; they are all fairly easy and don't necessarily require a press. 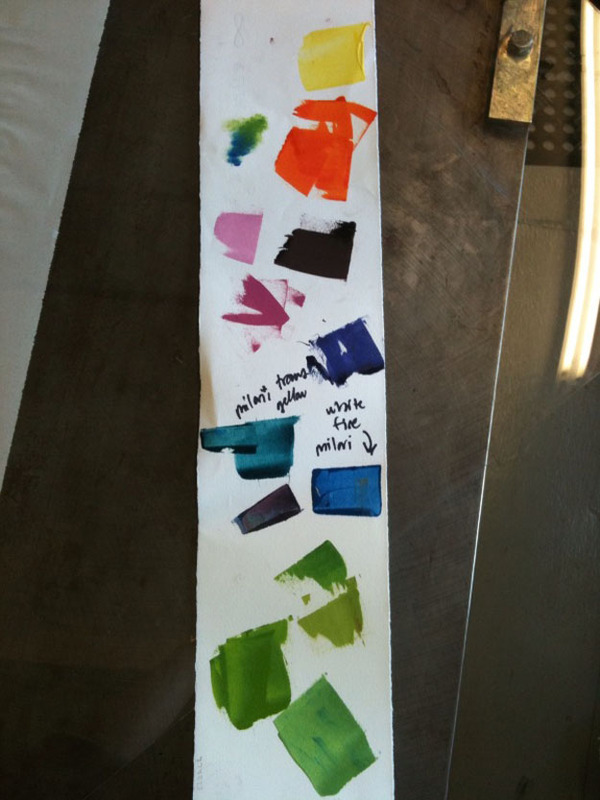 We mixed some colors for the conference-goers ahead of time (that's the palette above) and then brayered the ink on to some smallish, prepared beech wood sheets. The blue-green fade on the left was made on Japanese paper with just the solid ink block. 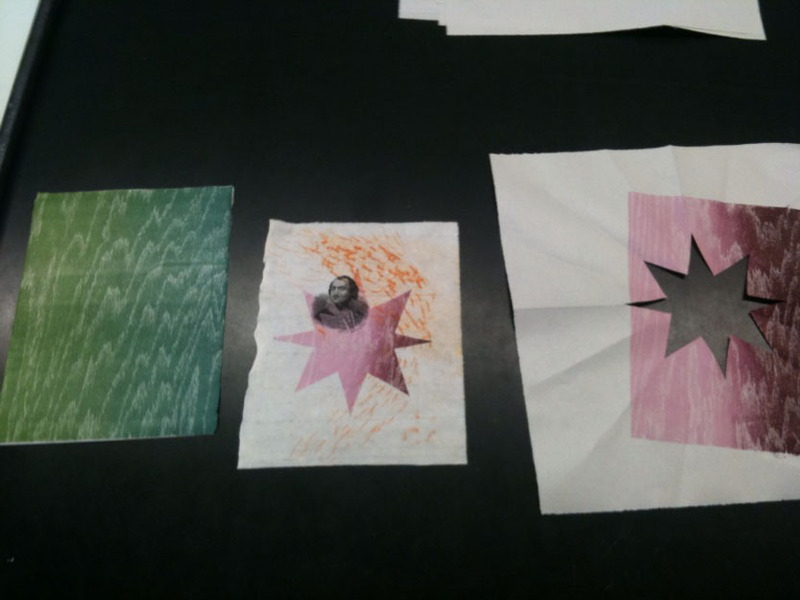 You can make a stencil print from there by laying your stencil between the block and the Japanese paper (print on the left, stencil on the right). 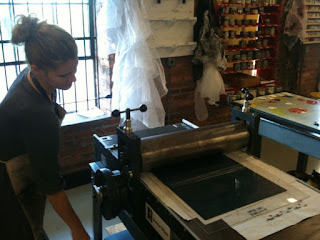 Here's the demo print, above! 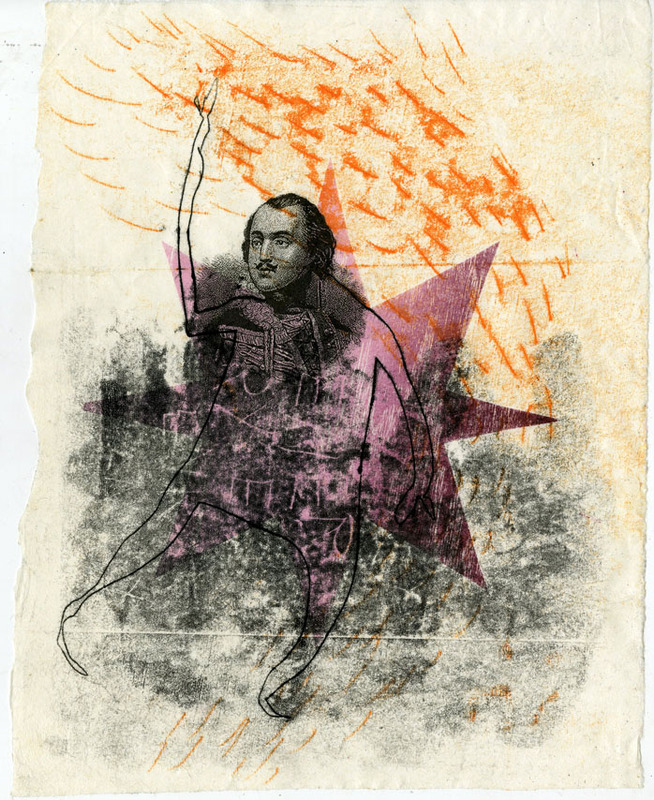 The orange marks and Gen. Casmir Pulaski's body are examples of trace monotype. 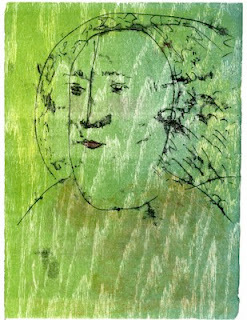 You lay Japanese paper onto a thin slab of ink (or an inked wood block) and draw through the back of the paper with the back of a brush, a finger nail, the palm of your hand, you name it. Pulaski's face was made using a pronto plate. Here's Jon teaching pronto plate technique. 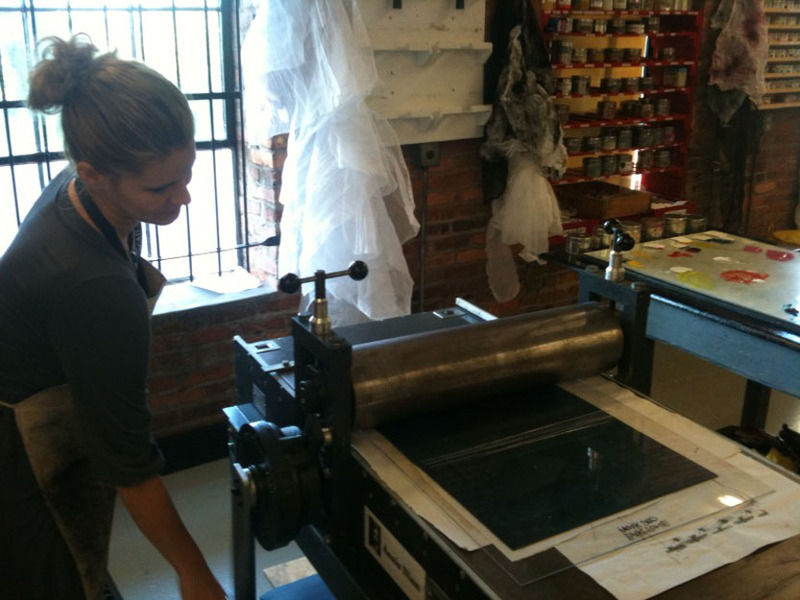 Pronto plate printing is similar to lithography, except that instead of drawing on a boulder with grease, you feed a piece of treated plastic through a laser printer. Hooray! Then you treat it with gum arabic, bake it, and ink that baby up. Then you can run it through a press or rub it with a baren (bah-ren) or a wooden spoon. And you can layer all of these techniques! Awesome. I spy Lara at the press!! !